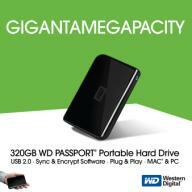 Western Digital has just announced that its WD Passport now has a 320B capacity. With videos and music going high definition, there's an increasing need for large capacity portable devices. Currently, SD cards and flash drives only has a maximum capacity of 16GB, a 320GB portable storage will enable to transfer larger files between PCs or carry around your personal files with you. The WD Passport 320GB costs $229.99 and is expected to be available this week.